Cotswold Edge Golf Club was founded in 1980 by the Newman family. The golf club was originally a piece of farm land that was a bit hilly for grazing so a decision was made to turn the land into a golf course. The golf club was opened on the 9th February 1980 by Anthony Kershaw Esq. MP. 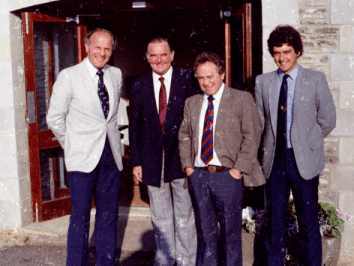 To mark the formal opening of the course and club a exhibition match was staged on the 31st of May 1981 featuring Sir Henry Cooper, Tom Graveney, Brian Huggett and Ian Watts, the clubs professional. The Cotswolds cover a region of 790 miles in the upper part of south-west England and is the country’s largest official designated ‘Area of Outstanding Natural Beauty’. Popular with both the British and international visitors form all over the world looking for various activities such as golf. With a quality 18 hole course with stunning views over the Cotswold country side located just up from the beautiful town, Wotton-under-Edge. Cotswold Edge Golf Club offers one of the best golfing experiences in any of the courses in the south-west of England. Cotswold Edge Golf Club is the trading name of Cotswold Edge Golf Club Limited - Copyright Cotswold Edge Golf Club Limited 2019, all rights reserved.